with Bob Redmond and Chris Crowley of NYC Parks. Install 20″ schist rock wall against old 18″ RR ties inside. Outside walls shaped around tree pits just inside new fence line. Make outside stone walls 15″ high (Parks suggests 6″ curb height for outside wall, sloping down from current 2′ RR ties -RING wonders about soil erosion?). Don’t remove old ties; let them rot. Add 2 more small (4′?) entrances to garden on Dyckman Street and Riverside Drive ~20-30′ from “the Point” — Broadway end. New design would add a small social area or patio in garden — where small gatherings can be held (between two new entrances) and extend grass across the north path grading up to railroad ties, and incorporate stepping stones to and from a group of benches at edge of grass. Stepping stones would also lead from current (south) path to meditative garden cove in the Japanese area (see schematic drawing). 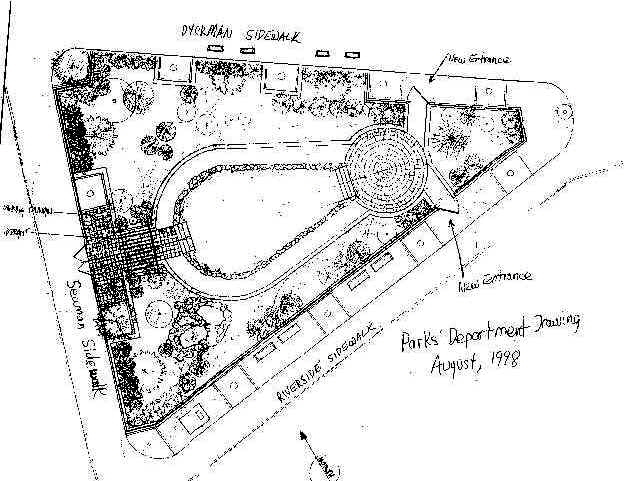 New design includes a small administrative area to the left after entering at Seaman Avenue so that composters, in-garden storage and water meter can be away from the Seaman entrance. Add new paving stones in patio, but not on south path as on original scope. (Parks likes the moss on south path. OK with RING) Cobblestone both new entrances to match the Seaman entrance.